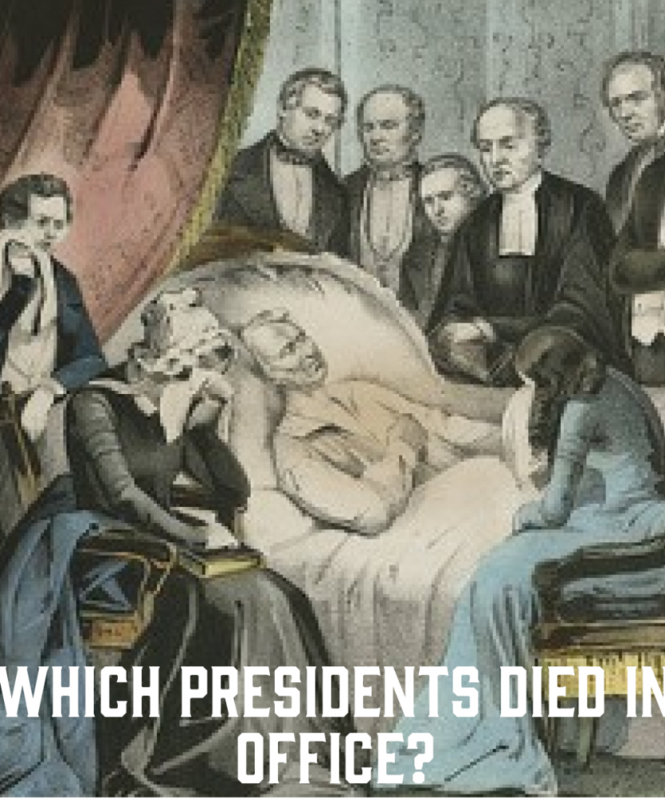 Which presidents died in office? Eight presidents died in office. William Henry Harrison died of pneumonia on April 4, 1841. Given on a cold and stormy March day, Harrison’s inaugural address is the longest on record. Harrison eventually got pneumonia (or maybe enteric fever) and died 32 days later, leaving behind the shortest presidential term of all. Zachary Taylor died suddenly in 1850. It was a hot Fourth of July in the nation’s capital, and President Taylor attended the celebrations. When he returned to the White House, he consumed water, iced milk, and a lot of cherries. Abraham Lincoln was shot on April 14, 1865. President Lincoln was attending the play “Our American Cousin” at Ford’s Theatre in Washington, D.C. when he was assassinated by well-known actor and Confederate sympathizer, John Wilkes Booth. It was five days after Robert E. Lee surrendered to Ulysses S. Grant at Appomattox Court House, Virginia. After he was shot, Lincoln was carried to a boarding house across the street from Ford’s Theatre. Lincoln died at 7:22 a.m. on April 15, 1865. Known as the house where Lincoln died, the Petersen House is now a historic site honoring the late president. James A. Garfield was shot on July 2, 1881 at the Baltimore & Potomac Railroad Station in Washington, D.C. A mentally unstable lawyer and writer named Charles Guiteau shot the president twice. Garfield hung on for months as doctors tried to locate the bullet and save the president. Garfield needed a medical miracle to save his life, but his doctors probably made things worse by prodding and probing the injured president. Alexander Graham Bell even attempted to locate the bullet using his induction balance, a primitive metal detector. On September 6, Garfield was transported to his cottage at Long Branch, New Jersey. President Garfield died on September 19, 1881, eighty days after being shot. William McKinley was shot on September 6, 1901 at the Pan-American Exposition in Buffalo, New York. A former steel worker and anarchist named Leon Czolgosz shot the president during a public meet and greet outside of the Temple of Music building. President McKinley was taken to the Exposition’s hospital for emergency surgery. The surgeon stitched up McKinley’s stomach, but was unable to locate the bullet. In the following days gangrene took over, with the president eventually losing consciousness. President McKinley died at 2:15 a.m. on September 14, 1901, with his wife Ida at his side. Warren G. Harding died on August 2, 1923 at San Francisco’s Palace Hotel. The president fell ill while on a cross-country speaking tour called “The Voyage of Understanding.” Harding’s wife, Florence, was reading the newspaper aloud when the president suddenly died in bed, the cause of death was most likely a heart attack. Historical rumors of Harding’s death have circulated for years. The most infamous tale involves Florence Harding poisoning her husband. None of the theories have been proven. Franklin D. Roosevelt died of a cerebral hemorrhage on April 12, 1945 at his retreat in Warm Springs, Georgia. The president was sitting for a portrait when he said, “I have a terrific headache.” President Roosevelt suddenly went unconscious at 2:15 p.m. and died two hours later at 4:35 p.m.
John F. Kennedy was shot on November 22, 1963 around 12:30 p.m. in downtown Dallas, Texas. President Kennedy was riding in an open convertible limousine – along with his wife Jacqueline, Texas Governor John Connally, and Nellie Connally, the governor’s wife. As the president’s motorcade passed the Texas School Book Depository gunfire rang out. Kennedy was shot, and the motorcade sped off to Parkland Memorial Hospital. Little could be done to save the president, and at 1:00 p.m. John F. Kennedy was pronounced dead. Kennedy’s suspected assassin was former marine Lee Harvey Oswald. While being transported from jail two days after the assassination, Oswald was shot by a nightclub owner named Jack Ruby. Conspiracy theories on JFK’s assassination continue to this day.